I am having a problem with my quiz question slides with hotspots and invisible buttons to walk a new user through a software program. Even though I have turned off the "next" button on the story view for these slides (I am using the default buttons), the default "next" button keeps coming up at the end of the timeline. I reset the story, I tried making a master page with the "next" button hidden as a trigger yet at the end of the timeline, the "next button" keeps becoming active again. I signed a non-disclosure so I cannot share my file to the general public. Sorry to answer my own question so quickly yet I found a stupid work around... I attached an image of this as well. I made a master page for these quiz pages and just made two triggers, one to keep the next button hidden at the beginning of the timeline and one trigger to keep the next button hidden at the end of the timeline. This way I can still use the default buttons and with as little of these as I need to do in a 100+ slide module, this is the quickest workaround. I'm not proud of this work around (not very savy) but it is working so far! 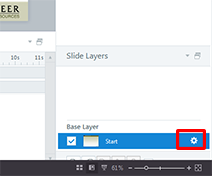 Click the little gear icon on the right hand side of the base layer in the slide layers panel. 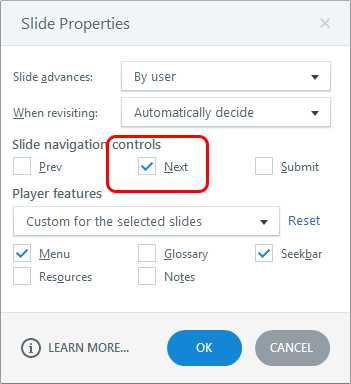 Click to uncheck the Next checkbox in the slide navigation controls area. I don't know if I had a little "glitch" yet I did that and it wasn't working. The next button was still coming up at the end of the timeline. The master page work around is working well for me - who knew? "Hi Melissa, Click the little gear icon on the right hand side of t..."